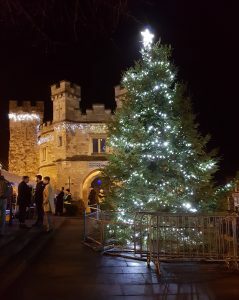 Town Council Celebrates Christmas Light Switch On. Organised by Buckingham Town Council this year’s Christmas light switch on was attended by more people than ever on Saturday. For the first time, a number of stalls set up for the day in the Cattle Pens, including a children’s ride. performances by the Buckingham Children’s Choir and Buckingham Stage Coach Performing Arts. The Winslow Concert Band provided the music for the carols and there was a special appearance by Father Christmas as well as Pucky the MK LIghtning Ice Hockey Team mascot. This year the Town Council entered a new 3 year contract for the festive motifs that are placed on the lighting columns in the town centre. The new multi-coloured lights proved popular with residents. There were some difficulties with sound, with those further away from the stage struggling to hear everything that was going on. The Town Council’s Town Centre & Events Committee agreed on Monday evening (3rd December) to ensure that next year there will be additional speakers and a higher stage to ensure everyone is able to fully take part. This entry was posted in Events and tagged Christmas Events, Christmas Lights Switch On, Father Christmas, MK Lightning, Pucky by Louise. Bookmark the permalink.